The phenomenon of incredibly talented Belgian fashion designer Raf Simons arose just in time when the whole world has held its breath while pending the tribute of the next House of DIOR’s great artist. It was that very moment when it was announced that Simons would replace Bill Gaytten as creative director and so the great changes were expected. The key of success most likely has been laid in his idolatry of so well-known but somehow almost forgotten “New Look” silhouette. Raf himself has expressed his particular interest for the period between 1947 and 1957, this is why perhaps it feels like the newest collections of the Fashion House reflect the true union of all the iconic symbols of that groundbreaking decade. US actress Jennifer Lawrence poses on May 18, 2013 as she arrives for the screening of the film “Jimmy P. Psychotherapy of a Plains Indian” presented in Competition at the 66th edition of the Cannes Film Festival in Cannes. Cannes, one of the world’s top film festivals, opened on May 15 and will climax on May 26 with awards selected by a jury headed this year by Hollywood legend Steven Spielberg. You may call it a coincidence but one of the most prestigious film festivals in the world The Cannes International Film Festival was founded just when Christian Dior founded his fashion house – in 1946. 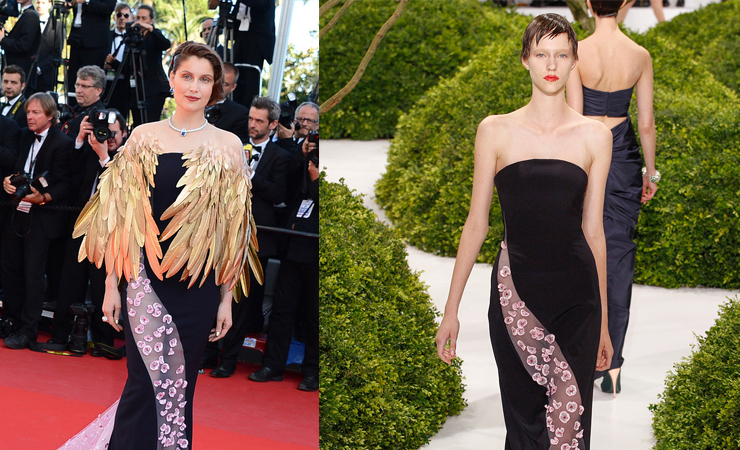 It’s really amazing to see this total allurement of Dior gowns that were created exactly by Simons at the red carpet of the event this year. This whole tendency might also be taken as bringing back the old good times when the vision of female elegance and “ladylike” style were finally integrated into the reality. This historical and truly symbolic appearance of two episodes becoming the legends has now returned once again after so many years have gone by. And today, in 2013 the annual festival in Cannes not only gives a massive media exposure to movie stars, film producers, movies themselves but also the designers whose beautiful dresses the most popular celebrities picked for their red carpet catwalk. Let’s start off with the stunning creations by the house that has surely become the most favorite of Oscar winning actresses on the red carpet wearing Dior which has made a major presence this Cannes season at every step! It was seriously hard not to notice! Looking like a real princess Nicole Kidman has transformed into Grace Kelly wearing that stunning strapless floral embroidered dress from Dior Spring 2013 Couture. Julianne Moore took Nicole’s example and also showed up in a large lilac colored Dior dress with black strapless detailing from Dior Spring 2013 Couture. Jennifer Lawrence with her short, new beach waves looked fabulous in Christian Dior but hasn’t gotten enough by showing off only one brand’s look. She also appeared in a black-and-white Dior gown, and then changed again into strapless white Dior dress with a striking silhouette. And we must admit we loved them all! Marion Cotillard wore a strapless Dior gown with such a popular trend of color blocks of blue, yellow, black and pink which by the way was shown just few days earlier in Monaco as part of Dior’s Cruise Collection 2014. It’s nothing but a huge manifestation of love to The House of Dior, admiration and salute, celebration and praise to what makes a woman look like a lady… lady DIOR in Cannes. The Fashiongton Post: Steve, what would be the three words to describe you and your personality?